Ozzie Menconi - "The Great Oz"
Ozzie Menconi (the Great Oz) says, "This is FrankenStar, world's fastest Royal. VMax rear, Baron's 1500 with Venture crank & counterbalancer, head work, fuel injection, Dyna, and custom paint by Alcalde customs. The wife started calling it Frankie because since '96 I have managed to change everything on the scooter." 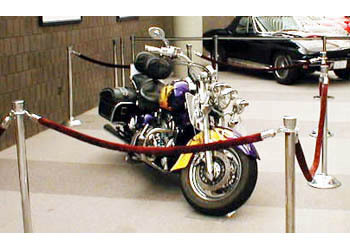 FrankenStar is shown here on display at the Corvette Museum.